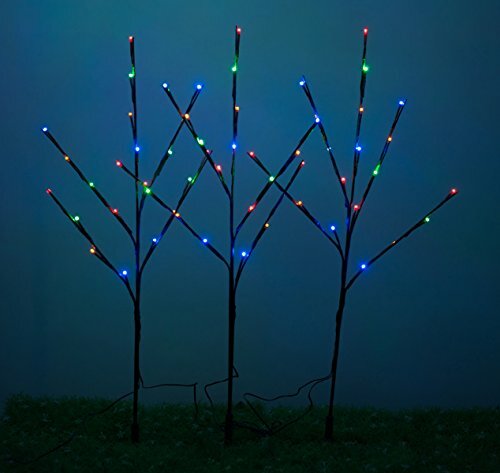 Brown Wrapped Lighted Twig Stake LED light is 26 inch tall and contains 60 Multi-Color LED. This fascinating tree light is definitely a perfect decoration for indoor and outdoor, such as your home, office, garden, yard, at Christmas, New Year. A novel and fantastic gift for your families, friends, loves, colleagues or yourself. The white LED lights meet the need of brightness, energy saving and long life span. 24V-UL-IP44 adaptor, which is low power and security, water proof, Safe for indoor or sheltered outdoor use. WED is short for Wish Everyday, Wish Everyday focuses exclusively on the design and creation of decorative lighting sets. WED Wish your life bright everyday! Bring more love and care to all of people around you! The best choice for you to issue a surprising gifts to your family, friends and lovers during the special date! The tree can be shaped as wanted by bending and arranging the branches to a natural and beautiful appearance! With IP44 waterproof level, we suggest not using the light in heavy wind or storm conditions. Wish you have long and beautiful sights! If you have any questions about this product by WED, contact us by completing and submitting the form below. If you are looking for a specif part number, please include it with your message.